Your Source for Great Value and Superior Service! Do you feel like you're spending far more than you should to heat or cool your home? Do you suspect that your old or deteriorating home insulation is to blame? Call in North Florida Spray Foam, Inc., Tallahassee's answer for spray foam insulation since 2006. Our team of foam insulation experts is ready to fill every crack, crevice, and gap in your building's structure to create an airtight insulation barrier that can greatly reduce your energy use and expenditure—while also improving interior air quality and blocking out unwanted noise. Whether you need crawlspace, wall, ceiling, or attic insulation, North Florida Spray Foam, Inc. is the insulation contractor you can trust. North Florida Spray Foam, Inc., is based in Tallahassee, but our service area also includes Quincy, Blountstown, Crawfordville, Havana, and Midway, FL, as well as Bainbridge and Thomasville, GA. We're willing to travel up to 100 miles to bring you the superior spray foam insulation services you need! We believe in our workmanship and we believe in our product—and we know you will, too. Are you looking for a spray foam system that's as safe and reliable as the Icynene system? Then you've come to the right place. On every foam insulation installation job, residential or commercial, North Florida Spray Foam, Inc., strives to provide you with the best possible workmanship. We also prioritize customer service. Ask us questions about spray foam insulation versus other types of insulation, and we'll be completely honest with you about the benefits and the costs. We'll even offer you a free cost estimate for your foam insulation job, based on our initial assessment. That's how serious we are about your satisfaction. 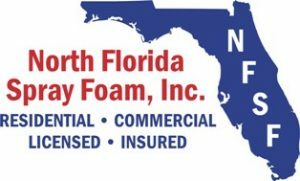 As a licensed, insured, and Better Business Bureau–affiliated company, North Florida Spray Foam, Inc. is committed to serving our community. Our customers are our neighbors, and we believe everyone deserves an insulation contractor who has the customers' best interests at heart. To that end, we offer top-notch service on all of our attic insulation, sound insulation, and other spray foam insulation applications. If you're ready to transition to a greener, more energy-efficient, and cost-effective form of home or business insulation, call North Florida Spray Foam, Inc. today! We've got the training, the skill, and the experience to meet your needs.